This report suggests a troubling problem in U.S. political news media: that Asian Americans, the fastest-growing racial group in the United States, are essentially absent in coverage of issues that are relevant to them. 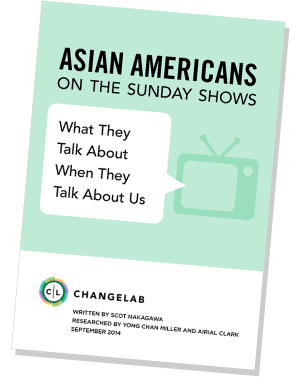 Over six months and 130 episodes of programming on the Big Five Sunday shows, Asian Americans were mentioned twice, not counting 11 incidental references to them as part of a broader listing of racial groups. The United States is a highly racialized society. Despite the insistence by some that the nation has achieved a post-racial meritocracy where everyone has an equal shot at prosperity, the reality is that race matters. It determines group-differentiated outcomes in nearly every aspect of American life. The racial wealth gap between African Americans and whites has nearly tripled in the last 25 years. Schools are more segregated today than they were 60 years ago. More Black men are under the control of the criminal justice system now than were enslaved in 1850. These urgent problems stem from the accumulated impact of a wide range of laws, policies, and practices in housing, banking, education, policing, and more that have relegated African Americans to the margins of our economy. Black voices and experiences must be central to public discourse about race for this reason. However, we cannot fully grasp the complexity of these problems, nor their possible solutions, without also understanding how Asian Americans and other communities of color figure in the racial landscape. We hope that this brief snapshot will spark new conversations regarding the diversity of the Asian American population, which encompasses 43 ethnic groups, occupies both extremes of the economic spectrum, and contrary to mainstream assumptions, leans Democratic. Asian Americans are both agents and subjects of U.S. politics, particularly on contentious issues like immigration, voting rights, and affirmative action. If the purpose of the news media is to foster and inform public debate on key political matters, fulfilling that purpose demands the inclusion of Asian American stories.